Launceston director of rugby Neil Bayliss says he is concerned at their poor start to the season. The Polson Bridge club have lost four of their six National Two matches in Bayliss' first season in charge. "I am concerned because we've only won two games, so it's not looking great on my part," said Bayliss. "But we're trying new stuff, we're learning new systems and we're working hard in games - it's just the top two inches that we're not quite getting." The Cornish All Blacks lost their first two games of the season by a single point to before wins against Shelford and Dings Crusaders. But defeats by and have left the club in 12th place in the 16-team division. "I know the boys are itching to go out and put in an 80-minute performance, not just a 60 or 65-minute performance. If we're going to get some wins that's what we're aiming for," Bayliss told BBC Radio Cornwall. Launceston hope to get back to winning ways when they host Chinnor on Saturday. "We need to start winning at home at Polson Bridge and start making it a fortress again and that starts on Saturday with a good victory over Chinnor," added Bayliss. "They've made some big-name summer signings but obviously haven't clicked yet as they're in the same pace as us having played six and won two." 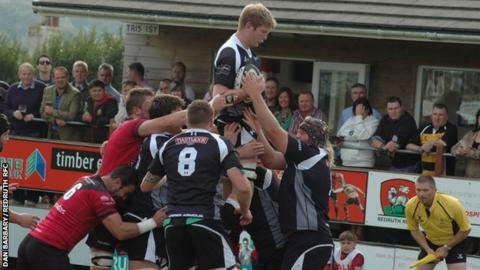 Cornish Pirates lock Charlie Davey could make his Launceston debut at Chinnor after moving to the club on loan. The 22-year-old, who joined the Pirates in the summer, has yet to play a game due to injury. "Having worked his way back to fitness the opportunity to acquire game time is now important," said Pirates director of rugby Ian Davies. "It helps the Cornish All Blacks at present and is also of benefit both for the player and the Pirates."